The Sad Knight of Prague Castle! 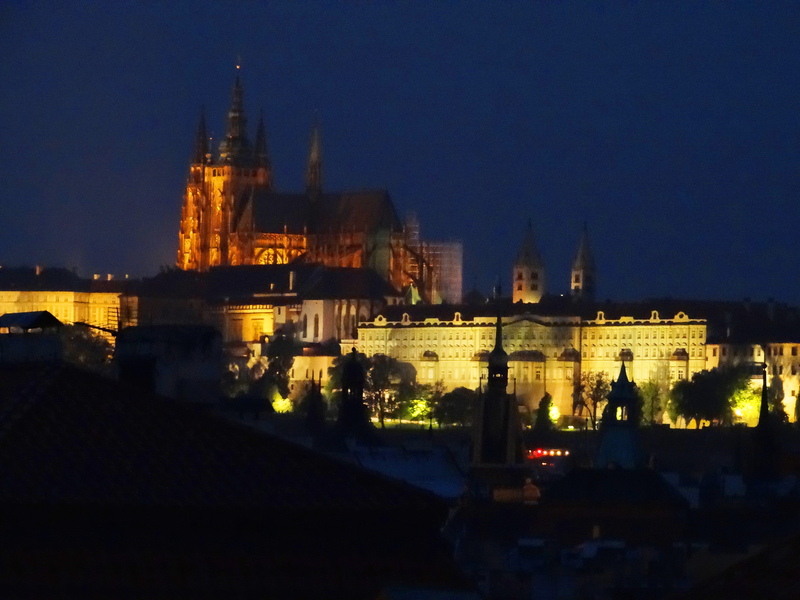 Prague Castle was founded in 870, but the actual construction dates to the 12th century. Guinness Book of World Records lists it as the largest ancient castle in the world. Like all castles it has it kinks and queens (sorry couldn’t resist) and it’s “knights in shining armor bent on chivalry.” Errrr…. except for this unhappy knight who looks like he was more bent on dodging his knightly duties. Who can blame him really? I suspect being a knight must have been over-rated, at least from the perspective of the individual knight. 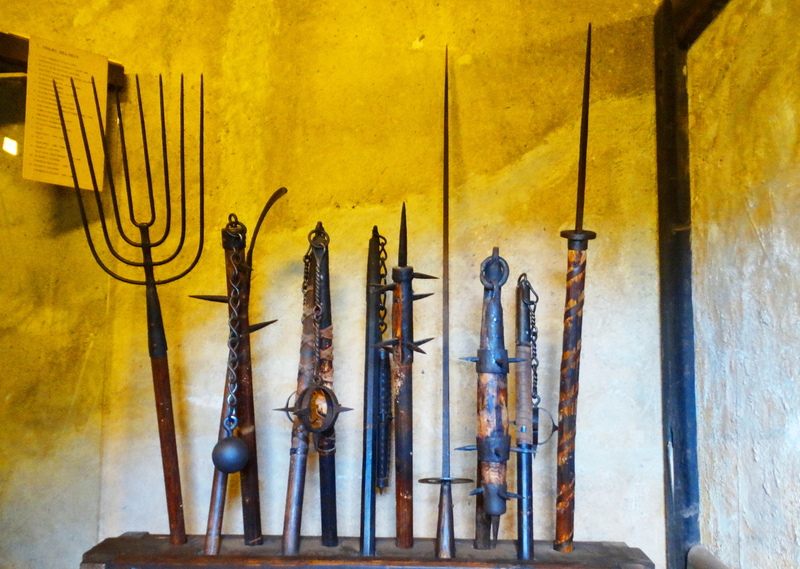 Seriously, who would want to be poked with one of these ghastly things. They didn’t even have antibiotics for heaven’s sake. Anyhoo as usual, I digress. 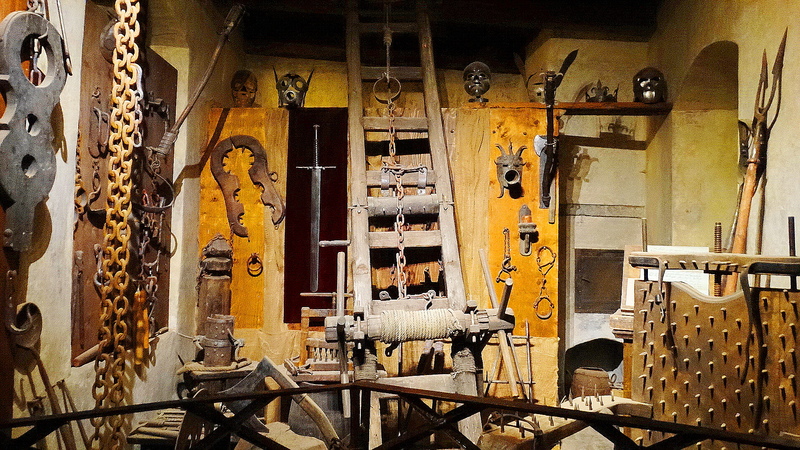 The castle, like all castles, had its torture chamber and dungeons. Plus, it has the strangest collection of creepy gargoyles I have ever seen. My next post will include photos of some of them. These of you with historically enquiring minds will want to check them out. They had a mad scientist at the castle, at least I’m assuming he was mad, since the knight was sad, and the angel murderous. 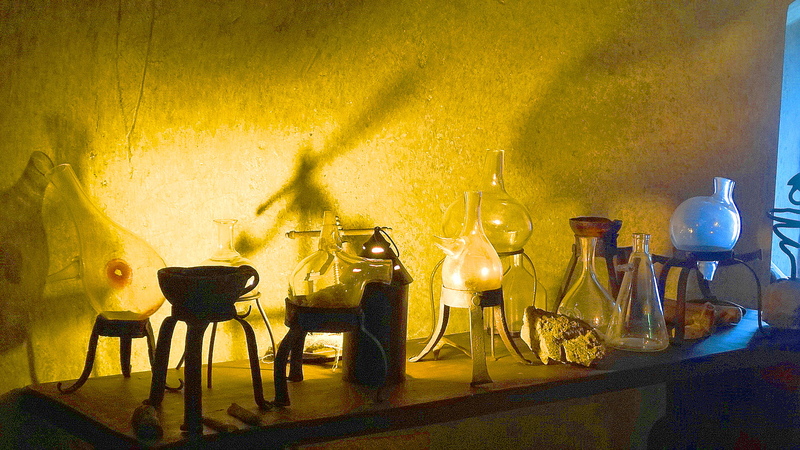 He may have been perfectly sane for all I know, but here are his rooms and potions and such….Maybe he was really just a kindly wizard? The castle does contain several beautiful churches including this one. And like all castles it had many beautiful places. It had royal jewels too, but these I didn’t bother to go see, as I liked the old books much more. The castle complex is said to contain every architectural style of the last millennium. An interesting historical fact about the castle is that during the Nazi occupation of WWII, the castle was usurped by Reinhard Heydrich who used it as his headquarters. Heydrich, who was born in Prague, was a principal architect of “the final solution,” and Chief of Reich Security. 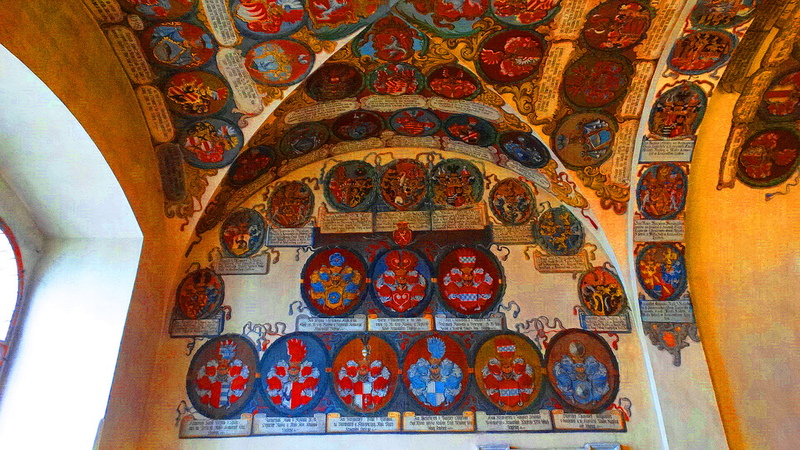 He was said to wear the Crown of Bohemia at times in the castle. He was attacked one day en route to the castle, by Czech resistance fighters, and died of his wounds a week later. 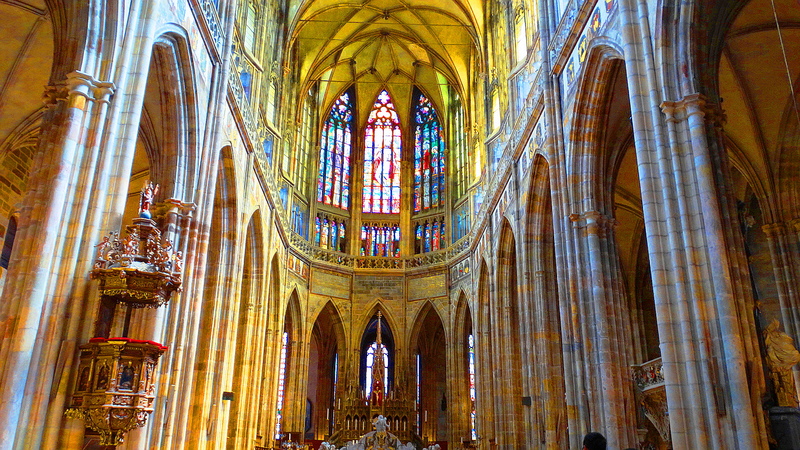 Prague Castle is truly beautiful and fascinating to visit. 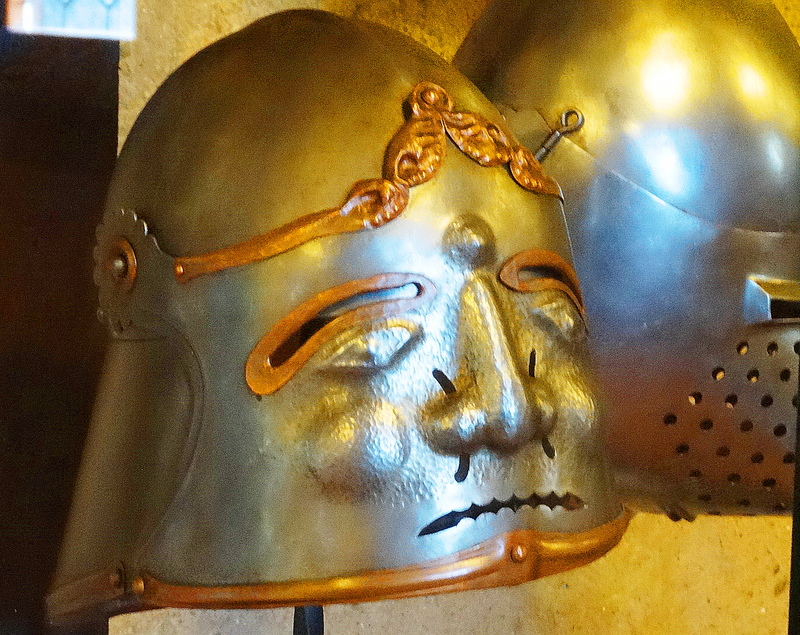 If you visit Prague, you must pop on by, and give your regards to the sad knight. And don’t forget the angel! I missed this one when I went to Prague. Pretty colors and pretty creepy place. A castle of opposites. Never been in Prague…it looks wonderful from your photos!!! It is a stunningly beautiful city! Thank you! I clicked on your pictures of the torture chamber. WOW! Those look really nasty up close! I remember touring the castle of Mad King Ludwig in Bavaria. It was beautiful. That was back in 1953 or was it 1952. But I can still remember it and it always comes to mind when I read of castles. Mad King Ludwig’s castles, he had three if I remember correctly, was a more contemporary monarch. He reigned was in the late 19th century. He was mad none the less, but his castles didn’t have torture chambers since he was more, uhhhh, modern. I remember touring them. Kooky dude. There needs to be a contest or something. Find a castle cindy has not visited. The real contest would be see if Cindy can remember the names of any of the castles she has visited!! My senior moments are more like years now!!!! Isn’t it the devil that the angel is killing? I think the devil isn’t actually supposed to be dead. Remember he was God’s favorite angel until he fell from grace. This is probably one of his minions or something. Well, you are right of course! Can you imagine the walls talking……How wonderful and scary that would be! oooh yes! Hadn’t thought of THAT! I certainly don’t want my walls talking! A fellow commenter (Igg and friends) explains the biblical explanation with more knowledge than I posess……You can read her comment below and it triggered a memory for me of Sunday School lessons and the avenging angel casting out demons…..so I am going to continue to believe in the compassionate benevolence of angels! What a beautiful place to visit… thank you for taking me there. Thank you so much for coming along! All the tools, weapons etc. remind me of Grimm movie. Now that you said this, can you imagine being a child in the castle having those Grimm fairy tales told to you???? To scary for words!!! Thank you for reading them and appreciating them! Love the photos – brought back fond memories of Prague. Have you been to the Loreto yet? Look out for the statue of the bearded lady being crucified upside down! 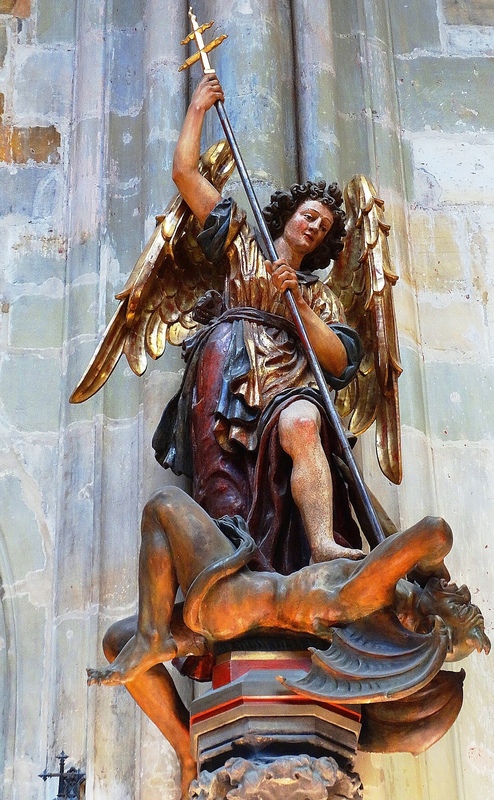 Btw, I think the angel is meant to be the Archangel Michael, throwing Satan out of heaven. Angels aren’t just messengers – in the book of Revelation they’re fighters as well. Thank you for you help with this & cheers to you! Great pictures. Looks like this castle has it all — from beautiful to creepy! I like to think of your angel as good vs. evil and good is, of course, winning! Yes I agree with you and see comment above with explanation that describes this in a bit more detail. My sense of angels is one of love and compassion, but they can be fighters too…..See above and cheers to you! another beautiful place to visit, when I get to Prague…someday!!! Yes, yes, please! I want to see your photos and hear your stories! 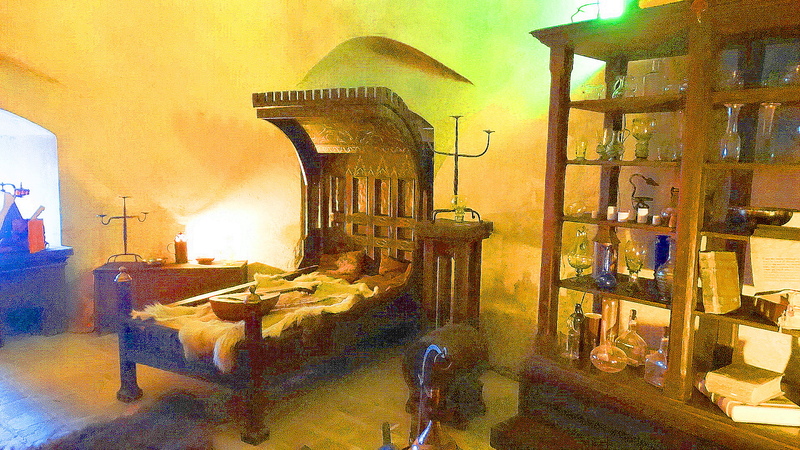 Fascinating – I liked the old bed and of course the old books, being a librarian! Thanks for taking me to this castle in Prague. Surely, there is story as to why the knight, but we could all begin spin our own tales as to why. Bet it would make for some interesting posts. Thanks for the like of “Signs of Things to Come”. His armor really stood out. Maybe someone will know more of the story……..Thanks & cheers! Crumbs, that angel is seriously not what I expected! The castle looks fascinating. I have never been to Prague but I hear it is amazing! Yes, the angel really shocked me. But if you read some of the above comments, you will see some better explanations. So we can all keep our opinions of angels!!!! If you don’t want to accept it, there is no problem. Oh thank you!! I am so appreciative and honored! Very kind of you. The only problem is the limited time, but thank you and cheers to you! I would not want to get on the wrong side of that angel! Very dangerous by the looks of it, no wonder the knight was looking so sad! Scary! Yes! I was floored by the angel, but if your read some comments above you see some explanations for her behavior which is very helpful to know! I really don’t think being a knight would be much fun at all!!! Cheers to you and Wolfie! The castle is outstanding, I’m sure the angel wouldn’t want a Nazi traipsing around her rooms. No and I agree with her!!! Cheers & thanks! 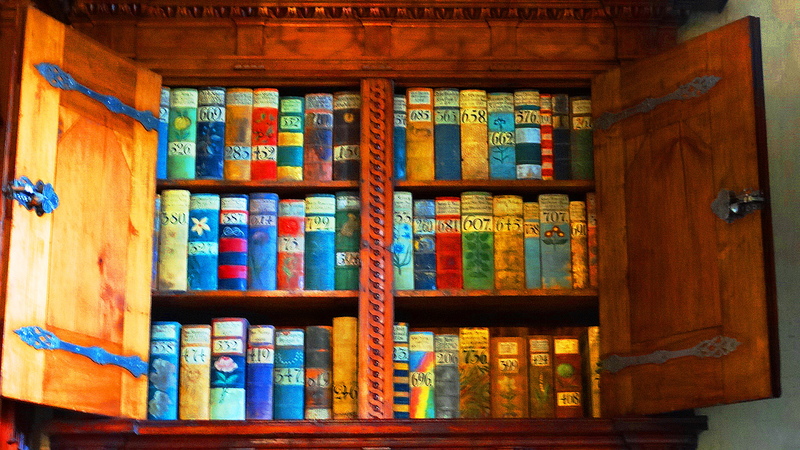 I LOVE those old books–and want to open every one….amazing pictures, Cindy. You are verrrry good at the camera thing!! I agree with you about the old books. I love them too & thank you!! Beautiful photos! I appreciate you sharing these so we all could see… I’d never be able to get there myself, but your pictures form a basis for my imagination. 😀 Hope you have a good weekend!